The immune system is a body’s defense against germs, microbes, bacteria and viruses that would otherwise kill us. Our bodies are constantly fighting germ warfare, using a complex arsenal of organs and special cells to clear infection from the body. When all is going well we don’t even notice our immune systems. It’s only when something goes wrong that we realize how very vital our immune systems are. There are several different things that can go wrong with the immune system. Immune deficiency can occur in diseases like Acquired Immune Deficiency Syndrome (AIDS) or as a side effect of chemotherapy. Hypersensitivity occurs when someone has allergies. Autoimmune diseases such as lupus and rheumatoid arthritis occur when the immune system actually attacks itself. And tumors occur when the immune system allows unchecked growth of cells, often times with cancer. Immune deficiency can be primary or secondary. In primary immune deficiency part of the body’s immune system is missing or does not function properly. The World Health Organization recognizes nearly 100 types of primary immune deficiency diseases including Severe Combined Immune Deficiency (boy-in-the-bubble disease). Because of advances in medical understanding, people who once would have died in childhood due to primary immune deficiency are often able to live into adulthood. Secondary immune deficiency is caused by factors outside the immune system, such as viruses (AIDS) or chemotherapy. These outside factors depress the immune system so that it is vulnerable to illnesses that normally are quite harmless. A depressed immune system cannot fight off illness. Chemotherapy destroys the “bad” cells of tumors, but also the good cells that fight infection. This is why people being treated with chemotherapy need to be very careful about what they are exposed to, as their bodies are too weak to fight off many infections and illnesses. Sometimes the immune system is hypersensitive. This is the case with allergies. The immune system reacts adversely to normally innocuous substances such as pollen, dust, animal dander or certain foods as it would react to more dangerous enemies. Allergic reactions can very from mild itching, sneezing, runny nose or watery eyes to severe swelling, hives and life-threatening anaphylactic shock. Allergies are often treated in children with a homeopathic-type approach: injections of tiny amounts of the allergen are given so that the child’s immune system will build an immune response to the substance. This process is called immunotherapy, or hyposensitization. Immunotherapy can eliminate or reduce the hypersensitivity. Still, many people suffer their entire lives with allergies, severely limiting their activities. 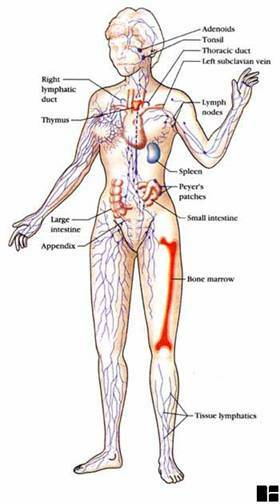 Autoimmune diseases occur when the immune system attacks itself. There are more than 80 types of autoimmune disease. These diseases include lupus, diabetes type 1 and rheumatoid arthritis. Autoimmune diseases can affect the connective tissues (the tissue which binds together body tissues and organs) and many other parts of the body like nerves, muscles, digestive system and endocrine system (the system that directs your body’s hormones and other chemicals). Most autoimmune disease occurs in women during their childbearing years. Healthy immune system response leads to the destruction of abnormal cells. Most abnormal cells are destroyed by our immune systems before they become clinically apparent. In an adult human body there are approximately 1011 cell divisions a day, with possibly 107 -- 109 spontaneous cell mutations occurring that could lead to cancer. A tumor is an abnormal growth or mass of tissue, one that the immune system allows to thrive. Tumors can be cancerous (malignant) or non-cancerous (benign). Typically there is a strictly controlled division of cells in the body, with new cells being created and old cells dying at a stable rate. If the balance of cell division and death is disturbed, a tumor may form. Lifestyle can contribute to the growth of tumors: smoking, drinking alcohol, obesity, excessive sunlight exposure and lack of exercise increase the risk of a cancer forming. Symptoms vary depending on the type and location of tumor. One often used treatment for cancer is chemotherapy, which kills the cancer cells. Unfortunately it also kills the good cancer-fighting cells of the immune system, making it more difficult to fight recurrences of cancer. As you can see, the activity of the immune system is of primary importance to the health of the body. When the immune system is not properly regulated it can attack its own tissues, succumb to disease or allow proliferation of cells into tumors. Acupuncture, moxibustion (the burning of herbs on top of needles) and herbs increase the quantity and quality of immune system function and help it to achieve homeostasis, or balance. Acupuncture is very effective in helping the immune system stay strong and effective. Though TCM (Traditional Chinese Medicine) does not recognize an immune system as such, it sees the body as a dynamic system of interrelated parts working together as a whole. When this system is interrupted, disease occurs. Acupuncture is all about balancing the system and bringing it into harmony. It enhances anti-inflammation, analgesic and microcirculation, which helps with rheumatoid arthritis. Acupuncture is very beneficial for those going through chemotherapy as it helps the immune system rebuild its strength, and also has the added benefit of controlling the nausea associated with chemo. Acupuncture strengthens the immune system to delay the growth of tumors and cause regression of established tumors. Dr. Wang has many cases and receives many referrals of patients going through cancer treatment, and he has seen acupuncture increase the survival rate in most cases more than five years. The five year survival is a measuring stick of success when treating cancer. There are several Chinese herbs that are helpful to maintaining a strong, healthy immune system. Two of the most commonly used herbal formulas are Jade Windscreen Powder (yu ping feng san) and Minor Blue Dragon Combination (xiao qing long tang). It is a good idea to take acupuncture every once in a while to give the immune system a “tune-up.” Many people try to get an acupuncture treatment once a month, while some rely on treatments four times a year, as the seasons change. In any case, acupuncture can help your immune system stay in peak performance.